Thanks to everyone who sent well wishes regarding my dad and sister's surgeries. The transplant took place a week ago today, and the patients have been home recuperating since the weekend. The rest of us have been pitching in to help keep the ship running smoothly, getting my nieces to and from where they need to be, and of course - feeding everyone. I made this the day before Mother's Day and left it for my sister, brother-in-law, nieces and mom to enjoy that morning (Dad didn't get discharged until later that day). Unfortunately, I didn't get to taste the goods, but I got several raves from all the guinea pigs! The cinnamon raisin bread just adds to the awesomeness that is overnight french toast :) Make it...SOON! Lightly butter a 3 quart pan (or similar) and cover the bottom with bread. In a bowl, combine 6 eggs, half & half, 1 cup sugar and 2 teaspoons vanilla. Pour half of the mixture over the bread. In another bowl, whisk cream cheese and remaining vanilla, eggs and sugar. Mix until smooth and creamy. Spread mixture over bread. Cover the contents of the pan with the rest of the bread, followed by the remaining egg mixture. Sprinkle with nutmeg. Cover and refrigerate overnight. Bake for approximately 60 minutes in a preheated 350 degree oven. Let stand 10 minutes before cutting. Oh good! I'm so glad to hear they're doing well! 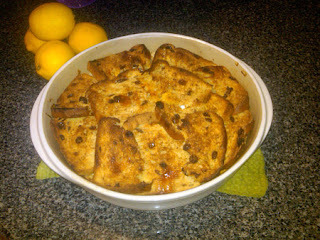 I'm sure this cinnamon bread french toast had something to do with it! Looks delicious! Made this today for my playgroup, thanks for sharing it! A Happy Mother's Day in advance! Sweets for Mom - and one last reminder!